The E20X "has Seat genes." 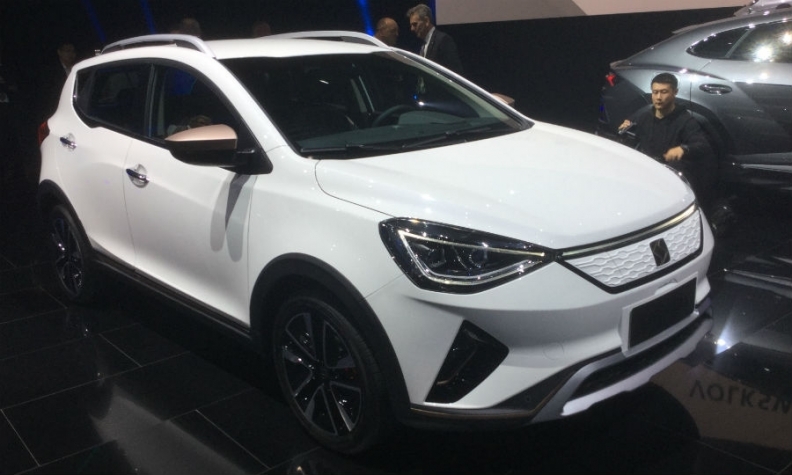 BEIJING -- Volkswagen Group's Spanish brand, Seat, is returning to China through a back door after playing a leading role in the development of the E20X electric crossover marketed under a new brand called Sol. Set to hit showrooms in the second half, the E20X will be the first car built by Volkswagen's new joint venture with domestic automaker JAC. It is based off JAC's S7 crossover. VW Group's China chief, Jochem Heizmann, said Seat supported the E20X's development. "If you look a bit more precisely at this car and its design, there are lots of Seat genes," he said at the recent auto show here. Heizmann said there will be more Sol-badged cars but did not give more details. "We are planning for sure in a joint venture not only this one car, but we are working together and looking at what will come after that of course," he said. Heizmann said E20X, which has yet to be priced, will have an electric range of more than 300 km under Europe's NEDC test cycle. It will help VW reach its mandatory targets in China for "New Energy Vehicles" under a system implemented to transition the country's fleet to zero-emission cars. Each legally independent company that sells cars in China needs to meet a minimum threshold starting next year. For every 10 vehicles sold, an automaker has to earn a single NEV credit in 2019. Selling one E20X would it would be already earn it four. Heizmann said Seat was a natural fit for Sol's target group. "The advantage of Seat is it has the youngest customers by far and a really innovative design that fits very well to China," he said. When asked whether Seat itself might return fully, he replied: "Let's see what is possible with Seat." Seat had initially attempted to use its own brand but was denied by the Chinese authorities, which insisted on a new local brand. The two eventually settled on the Spanish-sounding "Sol" name. "It's an indirect way of entering the Chinese market," Seat brand chief Luca de Meo told Automotive News Europe on the sidelines of the Beijing show. Seat’s sister brand, Skoda, began selling locally built cars in China in 2005. Since then China has become Skoda’s largest market. Seat briefly shipped a very small number of cars from Europe for sale in China before pulling out by 2015.